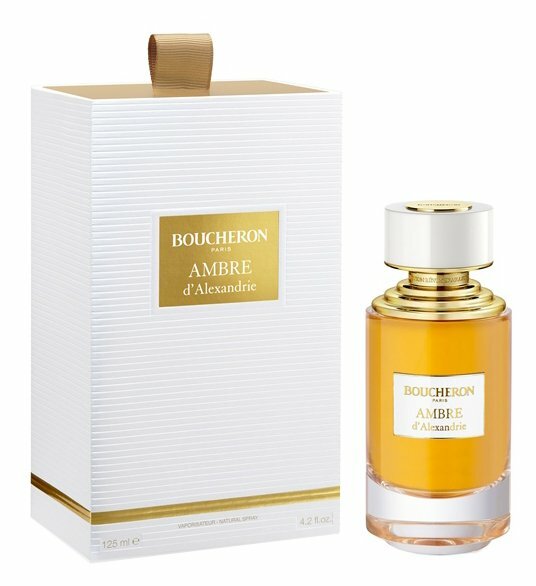 Ambre d'Alexandrie is a popular perfume by Boucheron for women and men and was released in 2017. The scent is sweet-spicy. The longevity is above-average. It is being marketed by Inter Parfums. First of all there is now the hype, or the mixed event related but from all sides commercialized or market. This is the place between the soap stand, the burnt almonds stand and the spice shop. He's already been smelled a thousand times. He says. No, I'm not. High stacker. He is one of many, he communicates by claiming the opposite. That he was exquisite, noble, extraordinary. As exquisite as an electric cigar from Cuba. Or a flying carpet that starts up when you knock it out for the first time. Looks like he's been around a long time. He's had to say for a very short time. Vehement. Alludes to Chergui. Plays on Nuit d'Issey (if you can use such an underdog as a reference). Can it be that I even think about the Amouage, and that although I have only tasted it once??? Actually alludes to all spice canonades. That's a lot of everything & a very little bit of everything. I'm wrong here, too. Yeah, yeah, yeah. That's not a trivial offence. Not my construction site. Not none of it. But not like this. Is a copy of the copy of Copy. Because? Because he only seems to exist for a long time. And that's not true. It's only just been on the market, and I'm writing my third comment. And not even a good one. A little orientalism comes up. Very nice name, actually. Strong, historical, exquisite implied. On the olfactory side probably rather quite a bit and also gscheid cheap. It's synthetical. The right Orient would be Arabia. What should the aroma be shisha steam? "Fragrance Synthetics." Amber. Hm, yeah, I'm fine. Doesn't give me much and is difficult. Any in the station suburb. But shop number nine. Labdanum, honey-sweet, all right, but for me it's something that can be in traces. Like the salt in a soup. There's no salt soup either. There's stone soup. But no salt soup. Salty soup again there is. Honey sweet is no perspective. Where's Amber? Could it be that I don't understand Amber at all? What do I even understand? Where is my sense of smell welcome? In this compilation quite clear, only valid for me, nowhere. Then there's musk as an all-purpose shredder. Musk is the thing that I absolutely cannot do and it is something that influences a fragrance as a whole. I find musk always inescapable. It dominates and smells. And I just don't like it and unfortunately I wrote it several times. Benzoe? Where's she hiding? The benzoin drives an electric car at best. There aren't any. Benzoin makes me think of Fahrenheit. Now I sit down in the electric car, steam a digital cigarette and drive into my bathroom to wash my arm. There are those perfumes that want to cut into this notch, that make use of several of these tasty ingredients, certainly also in good! Well, I don't like it, I wasn't merciful and didn't try hard to write. May someone else have more luck. And please forgive me _Not_! At first you can perceive an intense sweet - creamy bourbon - vanilla, which was stirred so long that only the cream - foam remained and was skimmed off. In the background a very fine and warming balsamic hint of milk chocolate is perceptible, so that one is already a little of the opinion that next to the cake there is a cocoa, the smell of which blows into one's nose and is due to the benzoin. This constellation is noticeable on my skin for 30 minutes before the heart note unfolds. The Bourbon vanilla is minimally dimmed in the heart note, but still very clearly perceptible and combines with a fine - light, yet deep - sweetish, slightly viscous, after "blossom honey" fragrant nuance, which gives the fragrance a captivating magic and comes from Labdanum. The Labdanum is surrounded by an incredibly beautiful cuddly and cuddly sweet-spicy note, which you can hardly resist, even the longing for love arises in you and stems from the amber chord. The heart note is noticeable on my skin for 5 hours before the base asserts itself. In the last 3 hours Ambre d'Alexandrie becomes very clear and pure thanks to the musk - lovely, without reminding of freshly washed laundry, which gets a smooth resinous touch from the amber, which hides a very discreet smokiness and lets the fragrance end beautifully. Ambre d'Alexandrie is a wonderful companion in the spring, autumn and winter months for women and men of all ages who are looking for a gourmandig sweet, creamy, spicy and resinous fragrance that has a yearning spell. In the first 2.5 hours, the Sillage is designed in such a way that one is perceived very clearly at the 3 meters and then swings for 2 hours to a very clearly perceptible whole arm length, before it is reduced in minimal steps until the end of the fragrance. Write the first Review for Ambre d'Alexandrie!